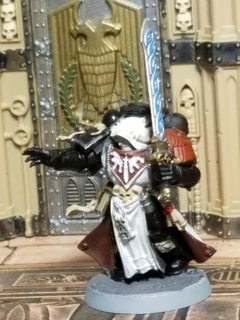 This is my Dark Angels portion of the Dark Vengeance set. Since I wanted slowing enter Warhammer 40K, I painted them up as Fallen so I could use them to bolster my Black Legion Chaos Space Marine collection. With recent (at the time of this writing) addition of the Fallen Dark Angel formation this worked out even better. Although, for simplicity sake, pretty much all these units are 'count as' their Chaos Space Marine equivalent when I use them. The only real issue is the Plasma Cannon which doesn't have anything close to a CSM equivalent. They also make a hand second Kill Team warband. He is called Garrison as he once destroyed an entire garrison of Imperial Guard in single combat. Upon learning some of the secrets of the Dark Angels this once Captain went renegade with some of his more loyal troops fleeing to the place that many traitors had before, the Eye of Terror. During his flight to the Eye, Garrison’s group encountered the Fallen librarian Benediction Nold. All trace of his past deeds and even his name have been erased with the aid of Benediction Nold. The librarian seemed to know just how to avoid the worst effects of the warp preventing Garrison and his men from fully succumbing to its mutating and insanity causing effect. A pompous and arrogant psyker who has time and again proven himself a courageous and excellent battlefield leader. However, it is impossible what secrets behind his cybernetic eye. While Nold is excellent in rally the warband’s troops, he is not trusted by Chaos Lord Galvanius or the sorcerer Ashneed whom they often find themselves allied with. As of yet, neither have any reason to suspect Nold beyond suspicion. It is this distrust that prevents the Chaos leaders to given the librarian any real control over the warband which only serves to grow Benediction’s contempt. Perhaps Nold was a completely loyal follower at one point and this constant snubbing of his ability will ultimately lead him to betraying the warband ironically. Only time will tell. The most famous of the Fallen often fights along side with this warband. 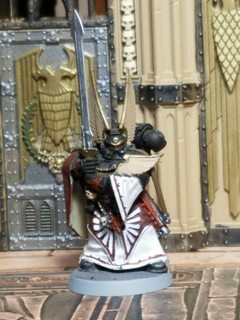 Often Cypher will lead a detatchment with Galavius' Black Legion warband in what seems to be a mutually beneficial alliance. He leads the warband's ancient element. Like his battle brothers, Captain Urza is filled with confusion concerning his predicament. His last memories were that of the battle on Caliban and even those are hazy. The Imperium is now a surreal place to the Captain who can barely comprehend the state it is and these strange Primaris things. He trusts Cypher and his battle brothers and serves despite the confusion seemingly allied with traitors one day only to fight them another. He seems to grasp the situation better than is lord Captain Urza Kaelon. In truth, this is because the warp has been whispering to him guiding his adjustment to the loss of ten millennium. This warp induced madness manifests as a calm off the battlefield where the Dark Angel warriors of the 31st millennium drawn upon as an anchor to the times they find themselve in. However, on the battlefield Rhellion is nearly as brutally savage as any of the Chaos allies they find themselves aligned with. This squad is lead by Sergeant Soriel "Sozo" Zoreal the model of the professional solder. This squad is the reserve squad used to back fill or perform specialized mission roles not suited for Squad Alpha. This squad is fanatically loyal to both Garrison and Benediction Nold. Like Galvanius’ Chaos Warband, the make use of Hellfire-neon plasma for their weapons. The squad is led by Sergeant Leonardo Basilli. On the plasma cannon is Hugues the Orange. The plasma gun operator is Ligier Wilmot. The remaining squad is: Reginaldus Ives, Amfried Rofle, Thancred Benardo, Beri Maucolyn, Renouart Dane, Rainard Lief and Ranulphus. This is a small squad of scouts used by the warband to keep up at least the appearance of Codex Compliant chapter when needed. They often pose as Raven Guard (or successor chapter of the Raven Guard) to allow them to gather intell deep into Imperium territory. The rarely see combat as they have proven themselves far too valuable as spies and saboteurs. This band is often broken into two or 3 squads on as needed basis by Cypher. The group posse a much greater arsenal of special weapons and knowledge of current battle tactics. This allows members to serve as the sergeants of the tactical squads of within the warband as needed. The biker marines of this small warband of the Fallen are the most corrupted by the warp. The bodies have yet to show the tell-tale signs of mutation, but their minds have not. They relish combat more than they ever had as loyalists. To the point they have a competition with Galvanius’ Warp Talons for both number of kills and spectacular kills. The squad is led by Sergaent Praxius Marhog. The plasma gun operator goes by the name ‘Fireburn’ and the last biker is known as Xephron Thunder-Eagle. Fiercely loyal to Captain Urza they follow his lead concerning the missing 10,000 years that have past since they last remember the galaxy. 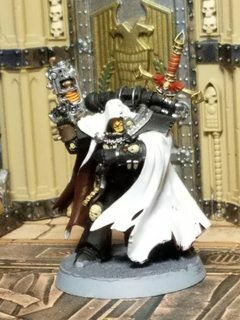 They do not trust Cypher nor the Black Legion Lord Galvanius and especially not the Black Legion warband's Champion, Saturmorn Carvilli. However, they do follow Captain Urza who has not had them fight along side their traitorous allies yet. This squad was not originally part of Garrison’s group and instead followed Benediction Nold originally. The just as aloof as their leader and rarely interact with anyone outside their squad. They are led by Screaming Night Raven. On the Assault Cannon is Buffalo Over Cliff. With the chainfist is Bear With Teeth of Wolf. The final squad members are Walks Like Mountain and Crazy Vulture. A mostly Ad Hoc unit they are the best of the limited anti-armor elements of the warband. Despite this, Galvanius covets them as his own Black Legion warband has not been able to develope a heavy weapons team as of yet.